Sport Court® Houston offers backyard basketball court construction to add to your backyard family fun. We proudly serve families in Houston and its surrounding areas, installing backyard basketball courts. Contact us today for a free consultation or on-site estimate. Install a backyard basketball court and your kids can practice day and night in the comfort of their own backyard and be able to take their basketball skills and athleticism to the next level. Give your kids an edge on their basketball game! Click here to see our backyard basketball court picture gallery. We are proud of Sport Court's® involvement with the 2011 NCAA Men' s and Women's Final Fours. Check out the NCAA thank you letter here. 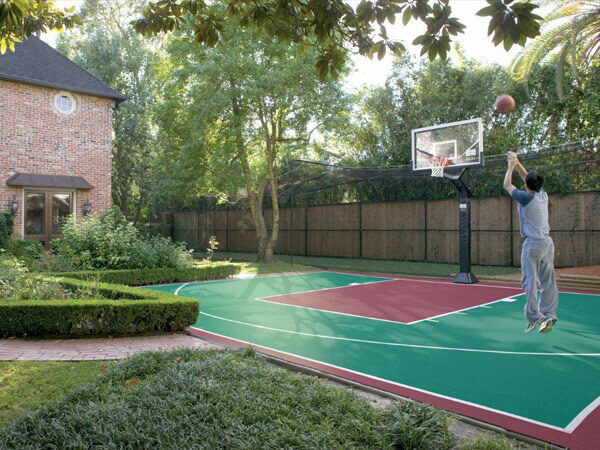 Use our Court Builder™ to design your own backyard or large facility game court. Choose your tennis court dimensions, colors, and accessories. You'll have the opportunity to print or email your design to your local Houston dealer where a Sport Court® sales representative will follow-up with you soon after to discuss your project details.